This plugin helps you to change the character set in tables, created by Textpattern versions older than 4.6 and/or MySQL versions older than 5.5.3 from ‘utf8’ to ‘utf8mb4’, which allows you to use the full range of UTF-8 characters, including emojis. Note that if you still use the ‘latin1’ character set, you have to use the rvm_latin1_to_utf8 plugin to change the character set to ‘utf8’ first. Please read the plugin documentation carefully before using this plugin. After plugin installation, just 2 clicks are needed to do let it do its job. Can handle textpattern tables with modified columns. Additional tables, created by plugins can also be upgraded (optional). On my local server, I’ve tried this plugin and I’m not sure if it worked properly. The same message gets repeated for the following columns: css, message, description, Form, caption, data, url, refer, user_html, description, val. If I look at the database on adminer, I see that some tables got a new collation (utf8mb4_unicode_ci) while others still have utf8_general_ci as collation. User_Error “Incorrect string value: ‘\xF0\x9F\x8E\x9B\xF0\x9F…’ for column ‘Body’ at row 1”. PS: btw, in the plugin page on your website, the “info” link for this plugin is not pointing to the correct URL (ie. this thread). You did create a backup first, right? 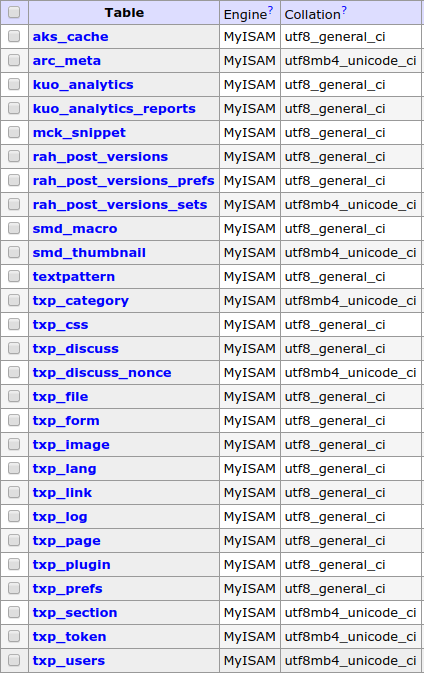 Restore it and edit textpattern/config.php and remove the utf8mb4 line. PS. info link fixed. Thanks! I’ve uploaded version 0.2 which should fix the issue manique mentioned. Can you test if it works for you after first restoring TXP to it’s original state? @ruud, after running v0.2, I’m getting the same alert messages when running the plugin and when trying to save an article with emojis. Only difference this time are the columns (I didn’t take note of all of them this time, but if you need it, let me know). Also, I’ve made `config.php` writable temporarily, just to test that too, and I can confirm that after the plugin ran successfully, `$txpcfg[‘dbcharset’]` is still set to `utf8` (a bug?). FYI, here is how the database looks before and after running the plugin. 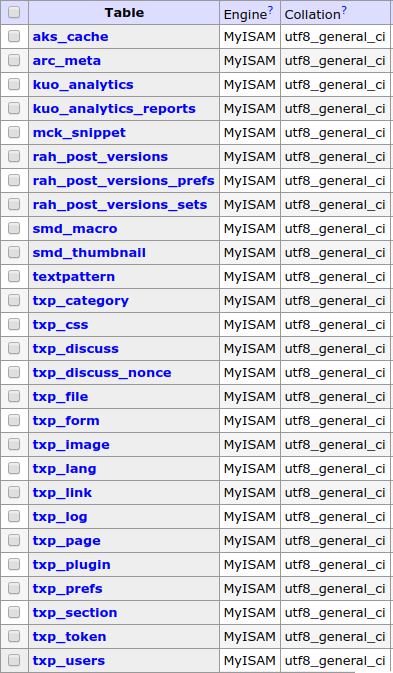 I’m not sure if it’s related to the issue (but I’d bet it is), but some content-related tables (like `textpattern`) are still shown as `utf8_general_ci’ while others non-content-related tables (like `txp_discuss_nonce`) are shown as `utf8mb4_unicode_ci`. Weird. Can you send me a dump of your database (before running the plugin), so I can try to figure out what’s happening.